You can place order in this section only if you have placed cloning jeans order earlier with us. Reorder by selecting fabric, designing details and your saved measurement profile of your old cloned jeans. No need to send us your favourite jeans again. Please select your saved measurement profile based on your last cloned jeans order. You can edit the measurement as desired. Carbon black twill weave denim. 13oz heavy 100% cotton denim - very sturdy and durable..
Hard enzyme washed at high temperature to give complete shrinkage..
Every jeans is custom made from fabrics- individually cut and stitched. Denim X washed at high temperature to give complete shrinkage and faded look. Stone Washed at high temperature to give complete shrinkage and faded look. 11oz medium weight pure black denim with 2% lycra. 11oz mid weight pure white denim in satin twill finish. Mid stretch denim - 2% lycra and 98% cotton. Suitable for all fit. 12 oz medium weight shaded dark blue denim. Twill weave texture. 100% cotton. Suitable for comfort, straight and slim fit for men and comfort fit for women..
Hard enzyme washed at high temperature to give complete shrinkage. 12 oz medium weight shaded medium blue denim. Twill weave texture. 100% cotton. Suitable for comfort, straight and slim for men and comfort fit for women. 12 oz medium weight icy blue denim. Twill weave texture. 100% cotton. Suitable for comfort, straight and slim for men and comfort fit for women. 13 oz dark blue sturdy classic vintage denim. Twill weave. 100% cotton. Suitable for comfort, straight and slim fit for men and comfort fit for women. 11oz medium weight shaded light grey color cotton stretch denim. Twill weave classic denim. Light stretch - 99% cotton and 1% elastene. Suitable for straight, slim and skinny fit for women and slim and skinny fit for men. 11oz medium weight levis blue cotton stretch denim. Horizontal Cross fire Weave. Medium stretch - 98.5% cotton and 1.5% elastene. Suitable for comfort, straight and slim fit jeans. 13.5oz heavy weight medium levis blue custom Selvedge Denim from one of the best mills in Japan. 100% cotton with red caste. Slight Cross fire weave. Cross fire denim has weave structures coming from the weft and warp. The fabric has been washed just enough so it's soft and at the same time it retains the selvedge crisp texture. Selvedge ID featured on the coin pocket, back belt loop and bottom hem. Suitable for comfort, straight and slim fit. 13.5oz heavy weight melange blue Selvedge Denim from one of the best mills in Japan. 100% cotton with red caste. Slight Cross fire weave. Cross fire denim has weave structures coming from the weft and warp. The fabric has been washed just enough so it' is soft and at the same time it retains the selvedge crisp texture. Selvedge ID featured on the coin pocket, back belt loop and bottom hem. Suitable for comfort, straight and slim fit. made to order selvedge denim - 13.5oz heavy weight classic dark blue Selvedge Denim from one of the best mills in Japan. 100% cotton with red caste. The fabric has been washed just enough so it is soft, yet retains its deep indigo hue. Selvedge ID featured on the coin pocket, back belt loop and bottom hem. Suitable for comfort, straight and slim fit. 12.5 oz heavy weight carbon blue Selvedge Denim from one of the best mills in Japan. 100% cotton with red caste. Selvedge ID featured on the coin pocket, back belt loop and bottom hem. Suitable for comfort, straight and slim fit"
11.5oz medium weight vintage mid blue cotton stretch denim. Cross fire Weave. Light stretch - 99% cotton and 1% elastene. Suitable for comfort, straight and slim fit jeans. 11.5oz medium weight classic dark blue cotton stretch denim. Cross fire Weave. Light stretch - 99% cotton and 1% elastene. Suitable for comfort, straight and slim fit jeans. 10.5 oz medium weight darkest blue cotton stretch denim. Twill weave classic denim. Medium stretch - 98.5% cotton and 1.5% elastene. Suitable for straight, slim and skinny fit for women and slim and skinny fit for men. 10.5 oz medium weight midnight blue cotton stretch denim. Twill weave classic denim. Medium stretch - 98.5% cotton and 1.5% elastene. Suitable for straight, slim and skinny fit for women and slim and skinny fit for men. 10.5 oz medium weight rusty blue cotton stretch denim. Twill weave classic denim. Medium stretch - 98.5% cotton and 1.5% elastene. Suitable for straight, slim and skinny fit for women and slim and skinny fit for men. 11oz medium weight dark blue cotton stretch denim. Horizontal Cross fire Weave. Medium stretch - 98.5% cotton and 1.5% elastene. Suitable for comfort, straight and slim fit jeans. 11.5 oz mid weight 100% cotton non stretch denim. Vintage dark blue twill weave denim. Suitable for comfort and straight fit for women and comfort, straight and slim fit for men. 11.5 oz mid weight 100% cotton non stretch denim. Classic medium blue twill weave denim. Suitable for comfort and straight fit for women and comfort, straight and slim fit for men. 11.5 oz mid weight 100% cotton non stretch denim. Ice blue twill weave denim. Suitable for comfort and straight fit for women and comfort, straight and slim fit for men. 11 oz mid weight light grey twill weave denim. Light stretch - 99% cotton and 1% lycra. Suitable for comfort and straight fit for women and comfort, straight and slim fit for men. 14oz heavy weight levis blue Selvedge Denim from one of the best mills in Japan. 100% cotton with white caste. Cross fire weave. Cross fire denim has weave structures coming from the weft and warp. Selvedge ID featured on the coin pocket, back belt loop and bottom hem. Suitable for comfort, straight and slim fit. 14oz heavy weight ice blue Selvedge Denim from one of the best mills in Japan. 100% cotton with white caste. Cross fire weave. Cross fire denim has weave structures coming from the weft and warp. Selvedge ID featured on the coin pocket, back belt loop and bottom hem. Suitable for comfort, straight and slim fit. 10 oz light weight cotton lycra denim. Classic medium blue. High stretch 97% cotton and 3% lycra. Suitable for skinny fit. 10.5 oz medium weight deep blackish blue denim. Twill weave rusty fininsh. High stretch - 97.5% cotton and 2.5% lycra. Suitable for slim and skinny fit. 11.5 oz mid weight crossfire denim. Medium stretch - 1.5% elastene, 98.5% cotton. Light blue denim suitable for all fit for men and for straight and comfort fit for women. 11.5 oz mid weight crossfire denim. Medium stretch - 1.5% elastene, 98.5% cotton. Medium blue denim suitable for all fit for men and for straight and comfort fit for women. 12 oz mid weight sturdy knitted denim with soft finish. Darkest blue twill weave fabric. Knitted fabric is a new trend combining the appearance of woven denim with the knitted structures' characteristics such as flexibility, softness and comfort. Medium stretch - 1.5 % elastene, 98.5% cotton. Suitable for all fit for both men and women. Raw washed at high temperature to maintain the original denim texture and color and also to provide complete shrinkage. 12 oz mid weight sturdy knitted denim with soft finish. Shaded indigo blue twill weave fabric. Knitted fabric is a new trend combining the appearance of woven denim with the knitted structures' characteristics such as flexibility, softness and comfort. Medium stretch - 1.5 % elastene, 98.5% cotton. Suitable for all fit for both men and women. 12 oz mid weight sturdy knitted denim with soft finish. Light shade Vintage blue twill weave fabric. Knitted fabric is a new trend combining the appearance of woven denim with the knitted structures' characteristics such as flexibility, softness and comfort. Medium stretch - 1.5 % elastene, 98.5% cotton. Suitable for all fit for both men and women. Cloud washed at high temperature to give complete shrinkage and faded look. 11 oz mid weight twill weave ribbed denim. Medium blue in color and medium stretch - 2 % elastene, 98% cotton. Suitable for all fit for both men and women. 11 oz mid weight twill weave ribbed denim. Sky blue in color and medium stretch - 2 % elastene, 98% cotton. Suitable for all fit for both men and women. 11.5 oz mid weight crosshatch denim with cross fire weave. Light stretch - 1% elastene, 99% cotton. Classic levis dark blue denim suitable for all fit for men and women except skinny. 11.5 oz mid weight crosshatch denim with cross fire weave. Light stretch - 1% elastene, 99% cotton. Classic levis sky blue denim suitable for all fit for men and women except skinny. 12 oz mid weight knit denim twill weave fabric. Knitted fabric is a new trend combining the appearance of woven denim with the knitted structures' characteristics such as flexibility, softness and comfort. Medium stretch - 1.5% elastene, 98.5 % cotton. Blackish dark blue denim suitable for all fit for men and women. 12 oz mid weight knit denim twill weave fabric. Knitted fabric is a new trend combining the appearance of woven denim with the knitted structures' characteristics such as flexibility, softness and comfort. Medium stretch - 1.5% elastene, 98.5 % cotton. Shaded dark blue denim. Suitable for all fit for men and women. 12 oz mid weight knit denim twill weave fabric. Knitted fabric is a new trend combining the appearance of woven denim with the knitted structures' characteristics such as flexibility, softness and comfort. Medium stretch - 1.5% elastene, 98.5 % cotton. Light blue denim. Suitable for all fit for men and women. 12 oz mid weight knit denim twill weave fabric. Knitted fabric is a new trend combining the appearance of woven denim with the knitted structures' characteristics such as flexibility, softness and comfort. Medium stretch - 1.5% elastene, 98.5 % cotton. Light blue denim with cloudy effect. Suitable for all fit for men and women. 13 oz medium weight levis blue 100% cotton denim. The weight is 13 oz but the feel and texture is not heavy. Dark blue twill weave fabric. Suitable for all except skinny fit. 13 oz medium weight midnight blue 100% cotton denim. The weight is 13 oz but the feel and texture is not heavy. Medium blue twill weave fabric. Suitable for all except skinny fit. 13 oz heavy weight darkest blue Selvedge Denim from one of the best mills in Japan. Light stretch - 98.5% cotton and 1.5% elastene. The fabric has been washed just enough so it is soft, yet retains its deep indigo hue. Selvedge ID featured on the coin pocket and bottom hem. Suitable for all fit for men and women except skinny fit. " 13 oz heavy weight shaded midnight blue Selvedge Denim from one of the best mills in Japan. Light stretch - 98.5% cotton and 1.5% elastene. Selvedge ID featured on the coin pocket and bottom hem. Suitable for all fit for men and women except skinny fit. 10.5 oz medium light weight classic twill weave light grey stretch denim. Medium stretch - 1.5 % elastene and 98.5% cotton. Suitable for all fit for women and for slim and skinny fit for men. 12.5 oz heavy weight dark melange blue Selvedge Denim from one of the best mills in Japan. 100% cotton. Cross fire weave. The fabric has been washed just enough so it' is soft and at the same time it retains the selvedge crisp texture. Selvedge ID featured on the coin pocket and bottom hem. Suitable for comfort, straight and slim fit. 12.5 oz heavy weight medium melange blue Selvedge Denim from one of the best mills in Japan. 100% cotton. Cross fire weave. The fabric has been washed just enough so it' is soft and at the same time it retains the selvedge crisp texture. Selvedge ID featured on the coin pocket and bottom hem. Suitable for comfort, straight and slim fit. 12.5 oz heavy weight light melange blue Selvedge Denim from one of the best mills in Japan. 100% cotton. Cross fire weave. The fabric has been washed just enough so it' is soft and at the same time it retains the selvedge crisp texture. Selvedge ID featured on the coin pocket and bottom hem. Suitable for comfort, straight and slim fit. 13 oz medium weight levis blue 100% cotton denim. The weight is 13 oz but the feel and texture is not heavy. Light blue twill weave fabric. Suitable for all except skinny fit. 12.5oz medium weight carbon dark blue denim. 100% cotton cross fire weave with soft texture. Suitable for all kind of fit except skinny jeans. 12.5oz medium weight levis medium blue denim. 100% cotton cross fire weave with soft texture. Suitable for all kind of fit except skinny jeans. 12.5oz medium weight levis light blue denim. 100% cotton cross fire weave with soft texture. Suitable for all kind of fit except skinny jeans. 10.5 oz medium light weight classic twill weave ash grey stretch denim. Medium stretch - 1.5 % elastene and 98.5% cotton. Suitable for all fit for women and for slim and skinny fit for men. 11 oz medium weight dark carbon blue Selvedge Denim from one of the best mills in Japan. Twill rainy weave texture. Light stretch - 98.5% cotton and 1.5% elastene. The fabric has been washed just enough so it is soft, yet retains its deep indigo hue. Selvedge ID featured on the coin pocket and bottom hem. Suitable for all fit for men and women. 11oz medium weight carbon dark blue Selvedge Denim from one of the best mills in Japan. Classic Twill weave 100% cotton Denim. Selvedge ID featured on the coin pocket and bottom hem. Suitable for comfort, straight and slim fit for both men and women. Not suitable for skinny fit. 12.5 oz heavy weight light blue Selvedge Denim from one of the best mills in Japan. 100% cotton. Cross fire weave. The fabric has been washed just enough so it' is soft and at the same time it retains the selvedge crisp texture. Selvedge ID featured on the coin pocket and bottom hem. Suitable for comfort, straight and slim fit. Measure the circumference at the place where you will actually wear your jeans. Your waist measurement will be the entire circumference of the area where your jeans will rest. So if you want a low, mid or high waist jeans you will measure the low, mid or high waist circumference and not your natural waist. While measuring, position the tape very close to the body without tightening. Wear a belt or rope around the place where you want your jeans to rest so that it will also help you to measure your length and crotch. You can also use a marker to highlight your waist line where you want to rest your jeans. Even up the jeans so that the back and the front waistline are parallel – in a straight line. Start from the edge – use your forefinger and thumb to hold the tape in a straight line. Measure it across. Multiply this by two to determine the full waist circumference. Measure your jeans from point A to B and then multiply by 2. 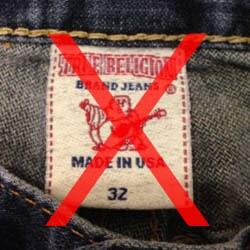 Please do not provide the label size of the jeans. First take the waist line taken for measuring your waist (calculated above) as the base. Measure the side of your leg from the waistline. Keep the tape parallel to your leg and let it flow free to the floor. This will be the outer length of your jeans. You can take this measurement either bare footed or wearing your shoes depending on your preference. Place the jeans flat on the surface exactly as shown in the image and then measure from point A to B. Please do not provide the length mentioned in the label size of the garment. Actual length of the jeans and what is shown on the label may differ. Stand in front of the mirror with your heels together. Measure around the fullest part of your seat by positioning the tape measure close to the body without tightening. While you measure, the jeans should be stretched out with no creases. Take center of the front crotch and go across edge to edge. Double this measurement. This is the seat or hip measurement. You do not have to measure from the stitching but from the edge to the other edge. Now double this measurement. Place the jeans flat on the surface exactly as shown in the image and then measure from point A to B and then multiply by 2. This is where the foot come out. Measure from one side of the leg opening to the other side. Double this measurement. Place the jeans flat on the surface as shown in the image and then measure from point A to B and then multiply it by 2. While you are measuring if you have any other preference for your new jeans you can modify the measurements accordingly. For example if the length of your jeans as you measured above is 38 inches but you want your new jeans to be couple of inches longer simply write down the length measurement as 40 inches instead of 38 inches. Measure from the back of your waistband (taken while measuring your waist), down and around, upto the front of your waistband – basically starting from the top of the back waist line and wrap around the measuring tape between your legs and take it all the way to the top of the front waist line. Please consider the waist line as provided above, for calculating the crotch. Measure from the crotch seam to the top of the front waistband seam of the jeans. Place the jeans flat on the surface as shown in the image and then measure from point A to B. Turn around the jesns and pull the jeans as shown in the image. The back rise is from the crotch seam to the top of waistband in the back. Place the jeans flat on the surface as shown in the image and then measure from point A to B.